The final congressional special election before the 2018 midterms takes place this Tuesday and it is shaping up to be a nail-biter. Voters in Ohio's 12th district will fill the vacancy created when Republican Pat Tiberi resigned in January. The most recent poll of the race showed just one point separating the nominees, Republican Troy Balderson and Democrat Danny O'Connor. This is an extremely tight race for Ohio, where the closest margin of victory in a 2016 U.S. House race was over 18%*. Regardless of who wins, the two will meet again in the November general election. Polls close at 7:30 PM Eastern. If you live in the 12th district, find your polling location. Tuesday also brings us primaries in Kansas, Michigan, Missouri and Washington. The poll closing times are listed in the table below, along with the number of congressional districts in the state - all are up for election in November - and whether there is a Senate and/or gubernatorial election in 2018. If you live in one of these states, click or tap the name to find your polling location. Washington is a top-two state, similar to California. All candidates appear on a single ballot. The top two vote-getters, regardless of party, moving on to the general election. * A consequence of the state's highly gerrymandered congressional districts. Fortunately, Ohio voters recently approved a resolution that will modify the process beginning with the next redistricting in 2021. A few highlights from Thursday's Tennessee primaries. For the vote totals for all congressional and gubernatorial primaries, go here. Businessman Bill Lee emerged from a crowded field to win the Republican nomination. Rep. Diane Black finished 3rd, becoming the fifth House member to lose* in a bid for higher office. Lee will start out as the favorite against the Democratic nominee, former Nashville Mayor Karl Dean. The current governor, Republican Bill Haslam, is termed-out. As expected, GOP Rep. Marsha Blackburn and Democratic former Gov. Phil Bredesen easily won their respective party's nomination. This is shaping up to be a highly competitive general election race. The current incumbent, Sen. Bob Corker, is retiring. All five incumbents that faced a primary challenge were victorious. Knox County Mayor Tim Burchett and businessman John Rose won the open Republican nomination in the 2nd and 6th districts, respectively. State Senator Mark Green was unopposed for the GOP nomination in the open 7th district. These are very safe GOP districts - Donald Trump won each by over 35% in 2016 - and all three are likely headed to Congress in 2019. * Idaho's Rep. Raul Labrador also lost a bid for governor, while Indiana's Todd Rokita and Luke Messer both lost in Indiana's U.S. Senate primary. In West Virginia, Evan Jenkins also lost his U.S. Senate primary. For more, see this List of 2018 House Retirements. We don't usually see Thursday primaries, but Tennessee holds one this week. The state has both a Senate and gubernatorial race this year, along with elections in its 9 congressional districts. Polls close at 8:00 PM Eastern Time, which is 7:00 PM local time for those in the Central Time Zone. Unlike many Southern states, there is no runoff - whomever gets the most votes moves on to the general election. Results will appear below after the polls close. Reload the page for the latest numbers. Republican Governor Bill Haslam cannot run due to term limits. On the GOP side, Retiring Rep. Diane Black (TN-06) started out as the frontrunner, but the primary has turned into a four-way race that polling indicates is too close to call. Polling has Karl Dean well ahead on the Democratic side. The general election is seen as Likely Republican at this point. Republican Senator Bob Corker is not running for reelection. While both parties have contested primaries, the real action in this race is expected in November. Republican Rep. Marsha Blackburn (TN-07) and Democratic former Gov. Phil Bredesen should coast to their respective party nominations. Bredesen has had a small lead over Blackburn in most recent general election polling. However, this remains a deep red state - Donald Trump won by 26% in 2016. As such, the general consensus of this race at present is Leans Republican. Three Republican members of the Tennessee U.S. House delegation are not standing for reelection in November. This includes the aforementioned Diane Black & Marsha Blackburn, as well as the retiring 16-term incumbent in the 2nd district, John Duncan. While these three districts will have new names on the ballot, they are safe GOP districts. In fact, none of the state's nine districts is expected to be competitive this fall. After a quiet month of July, the calendar picks up again next week. Tuesday the 7th will see primaries in Kansas, Michigan, Missouri and Washington state, along with a competitive special election in Ohio's 12th congressional district. The seat has been vacant since January, when former Rep. Pat Tiberi resigned his seat. This Central Ohio district leans Republican - Tiberi won reelection by 36% in 2016, while Donald Trump defeated Hillary Clinton by 11%. It has not elected a Democrat since 1980. Regardless of who wins on Tuesday, these two will meet again in the November general election for a full two-year term in the 116th Congress that begins in January. We've added a new 'tilt' ratings option on the interactive maps. 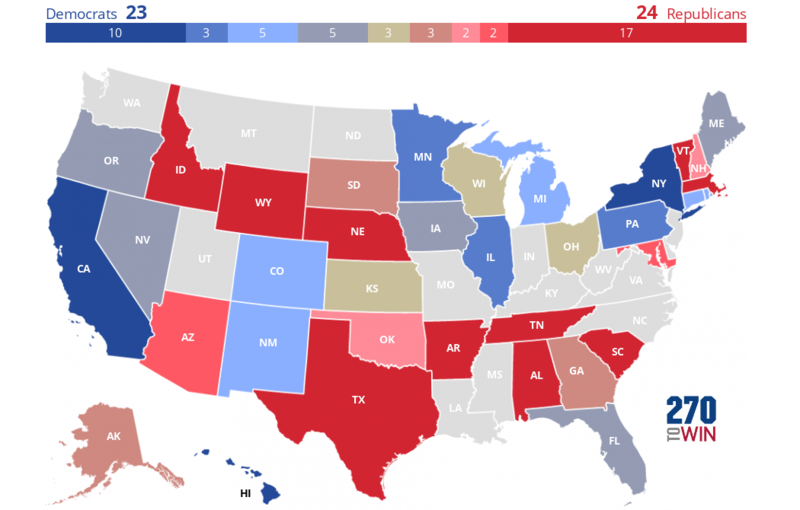 It is currently available on the gubernatorial maps, with Senate and House to follow in the near future. The tilt rating sits between toss-up and leans. The forecaster Inside Elections uses this designation for races that are highly competitive, but where one party has a slight edge. Among the 36 gubernatorial contests in 2018, they currently rate Michigan and Nevada as Tilt Democratic, with Alaska and Ohio Tilt Republican. Georgia Secretary of State Brian Kemp moved on to the general election after easily defeating the state's Lt. Gov. Casey Cagle in Tuesday's Republican gubernatorial runoff election. Recent polling had indicated that Kemp had moved ahead in the race, but none foresaw Kemp's 39% margin of victory. Kemp will meet Democratic nominee Stacey Abrams in the general election. Abrams is attempting to become the first black female governor in the nation's history. The most recent poll of the race, conducted by SurveyUSA, showed Kemp with a two point lead, well within the margin of error. It will be interesting to see if/how that margin changes now that the GOP nomination has been decided. In the 6th district Democratic runoff, gun control advocate Lucy McBath defeated businessman Kevin Abel by 7.5%. McBath meets incumbent Republican Rep. Karen Handel in November. Handel will be seeking her first full term after winning a high-profile special election over Jon Ossoff in 2017. Handel will start out the favorite; although this is likely to be one of the most competitive districts in the state. Meanwhile, in the 7th district Democratic runoff, college professor Carolyn Bourdeaux edged businessman David Kim for the nomination. Bourdeaux will face off against Republican Rep. Rob Woodall in November. This district is seen as a tougher 'get' for Democrats - Woodall is a four-term incumbent who won re-election by 21% in 2016. Trump won here by 7%, while his margin in the adjacent 6th district was under 2% over Hillary Clinton. There are three runoff elections of note in Georgia Tuesday. Republicans will choose a nominee in the gubernatorial race, while Democrats will go to the polls to do the same in the state's 6th and 7th congressional districts. Polls close at 7:00 PM. Results will begin to appear on this page shortly thereafter. Reload for the latest updates. In the gubernatorial race, Republican Lt. Gov. Casey Cagle faces off against Brian Kemp, the Secretary of State. Cagle received more of the vote (39% to Kemp's 25%) in the May 22nd primary and also led in early runoff polling. However, two of the most recent polls have Kemp well ahead by 18 points, while a third has him up by 6%. Kemp was also endorsed by President Trump in a tweet last week. The winner will meet Democratic nominee Stacey Abrams in the general election. Abrams is attempting to become the first black female governor in the nation's history. The most recent poll of the race, conducted by SurveyUSA, shows a surprisingly competitive race in a state that last elected a Democratic governor in 1999. Both Cagle and Kemp lead Abrams by 2 points, well within the margin of error. The consensus view of the general election is likely Republican, although that may change if Kemp wins the nomination; as Cagle is seen as the stronger general election candidate. Turning to the House of Representatives, Democrats will choose a nominee in runoff elections in two Atlanta-area districts. Both GOP-held districts are the only two potentially competitive general election districts in the state, although the 7th is more of a reach for Democrats. In the 6th district runoff, gun control advocate Lucy McBath squares off against businessman Kevin Abel. The winner will meet incumbent Republican Karen Handel in November. Handel will be seeking her first full term; she won a high-profile special election over Jon Ossoff in 2017. Meanwhile, in the 7th district runoff, it is a college professor, Carolyn Bourdeaux up against businessman David Kim for the nomination. The winner will meet Republican Rep. Rob Woodall in November. This district is seen as a tougher 'get' for Democrats - Woodall is a four-term incumbent who won re-election by 21% in 2016. Trump won here by 7%, while his margin in the adjacent 6th district was under 2% over Hillary Clinton. The 'color chooser' option has been added to the House and gubernatorial interactive maps; this feature was launched on the Senate map in June. Previously, the only option for creating your map was to click or tap a state or district repeatedly until arriving at the desired rating. This can be a bit cumbersome if you are building a map with all seven available ratings. The new Color Chooser allows you to select a color/rating such that only one click is necessary on a race to get the desired rating. Check it out in the short video below. We've relocated the information for House incumbents to make it easier to view while you are interacting with the map. This data now appears below the Map Color Palette to the right of the map. You will see the information box as you hover over a district, or tap once on a mobile device. A tablet screen or larger is recommended for a better experience with the House map. Rep. Martha Roby easily won renomination in the Republican primary runoff in Alabama's 2nd congressional district on Tuesday. She defeated former Rep. Bobby Bright by a 68-32% margin. Coasting to this easy win, Roby appears to have gotten past the issues around her loyalty to President Trump. Those hindered her re-election campaign in 2016, where she won by only 8% in this very conservative district. Roby will be the prohibitive favorite over Democratic nominee Tabitha Isner in November. Next Tuesday, there are two runoff elections in Georgia. In the gubernatorial race, Republican Lt. Gov. Casey Cagle faces off against Brian Kemp, the Secretary of State. Cagle received more of the vote (39% to Kemp's 25%) in the May 22nd primary and also led in early runoff polling. However, the race appears to have tightened and could go either way. The winner will meet Democratic nominee Stacey Abrams in the general election. In Georgia's 6th congressional district - one of the only potentially competitive general election districts in the state - gun control advocate Lucy McBath meets businessman Kevin Abel in a runoff for the Democratic nomination. The winner will meet incumbent Republican Karen Handel in November. Handel will be seeking her first full term; she won a high-profile special election over Jon Ossoff in 2017. If the MLB All-Star Game doesn't hold your attention, there is one interesting election in Alabama Tuesday. Four-term Rep. Martha Roby faces off against former Rep. Bobby Bright for the Republican nomination in the state's second congressional district. No candidate received a majority of the vote in the state's June 5 primary, forcing today's top-two runoff. Roby received about 39% of the vote last month, Bright 28%. Polls close at 7:00 PM local time (8:00 PM Eastern). Results will appear below after that time; reload the page for the latest. Roby defeated Bright, who was then a Democrat, in the 2010 election. She was easily re-elected by around 30% in both 2012 and 2014. However, in 2016, after criticizing then-candidate Donald Trump over the 'Access Hollywood' tape, her margin of victory fell to just 8% in a district Trump won by 32%. Roby has become a supporter of Trump's agenda and was rewarded when the president endorsed her in June. Congresswoman Martha Roby of Alabama has been a consistent and reliable vote for our Make America Great Again Agenda. She is in a Republican Primary run-off against a recent Nancy Pelosi voting Democrat. I fully endorse Martha for Alabama 2nd Congressional District! The Southeastern Alabama second district is solidly Republican; today's winner will be the overwhelming favorite in November against Democratic nominee Tabitha Isner. If Roby were to lose, she would be the fourth House member to be defeated in a primary this year. The first two upsets were GOP incumbents: In May, Rep. Robert Pittenger (NC-9) lost, followed about a month later by Rep. Mark Sanford (SC-1). In late June, Democratic Rep. Joseph Crowley (NY-14) was ousted. This article was updated on July 18th to reflect that if Roby had lost she would have been the fourth House member to be defeated. The original article omitted the primary loss by Joseph Crowley.